In response to Ryan Brown's post on his blog today with the Fall 1988 issue of Model and Toy Collector, here's the cover to the monster "Special #3" issue that wasn't kidding when it called itself a 1991 Buying Guide. This thing is PACKED full of the TMNT goodies. Interviews, art, product pictures, more art! There's even an article with pictures of Ryan's Hallowieners characters. I think magazines often get overlooked a lot as far as collectibles go. Yeah, they're probably not something to invest in if you're looking to make a profit, but for a devoted fan they can be a wealth of information and pictures. Unfortunately, this holds more true for the magazines of 10-20 years ago. Current magazines tend to be more likely to all be recycling the same information and especially the same pictures. Not one magazine article about last year's TMNT movie had a unique picture. The article that appeared in the Sci-Fi Channel's magazine was so poorly written and full of misinformation that I couldn't even bring myself to purchase it. 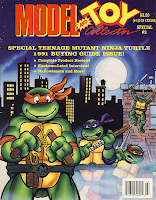 Luckily, the TMNT hit their stride during a period of time when there was no Internet and underground fanzines and genre magazines were the only way to get information about your favorite comics, TV shows, and movies. Because of this, there is a seemingly endless supply of fantastic TMNT articles from a whole range of magazines. This particular issue of Model & Toy Collector is easily among the best of them. I'll keep in mind to post some of my other favorites in the future.